The online version of this article ( https://doi.org/10.1186/s12915-019-0649-1) contains supplementary material, which is available to authorized users. Both the environment and wildlife are major sources and reservoirs of resistance gene diversity [8, 9]. The ecological niches and behavior of birds make them particularly likely to transport antibiotic-resistant bacteria. Migrating bird species transport pathogens which may contain antibiotic resistance genes across large distances [10, 11]. Birds also serve as sensitive bioindicators of environmental contamination with antibiotic-resistant bacteria [10, 12, 13, 14, 15, 16]. For instance, ESBL-producing Escherichia coli were found to occur over three times more frequently in gulls than in humans in the same region . Bacteria resistant to β-lactam and tetracycline drugs are commonly found in the gut microbiome of birds, especially in scavenging and aquatic species, such as waterfowl, gulls, and waders [10, 12, 14, 17, 18, 19, 20]. Aquatic bird species likely acquire these genes through contact with contaminated water. Human sewage is enriched in antibiotic-resistant bacteria, which are only partially removed during the water treatment process [21, 22, 23, 24, 25, 26]. Birds in contact with wastewater treatment influents or effluents could therefore be at increased risk of acquiring these genes, although empirical data to support this idea are scarce . 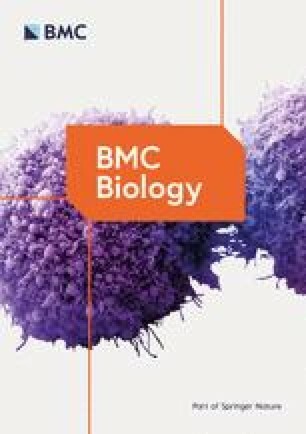 While the majority of studies on birds were based on bacteria cultured in vitro, the development of culture-independent sequencing techniques has substantially expanded our knowledge of the environmental reservoir of resistance genes [7, 9, 27, 28, 29, 30, 31, 32]. Among these techniques, sequencing the entire set of transcribed (i.e., expressed) genes via “meta-transcriptomics” has rarely been used in the context of antibiotic resistance, despite its advantages. In particular, use of meta-transcriptomics allows data to be obtained from the entire microbial community, with a focus on functionally active genes. This is important because genetic material is a metabolic burden and genes that are not essential tend to be lost [33, 34, 35, 36]. In the absence of selection pressure exerted by antibiotics, it is likely that resistance genes are regularly lost by bacteria, either by large deletions or gradual deactivation (erosion). Other high-throughput techniques, such as DNA-based metagenomics, cannot distinguish recently deactivated resistance genes from their functional relatives. An alternative is to clone inserts from environmental strains into cultivable vectors (e.g., E. coli), select for resistance in vitro, and then sequence their genomes (e.g., [17, 22]). However, this approach can result in bias towards genes present in organisms closely related to the cloning vector . Meta-transcriptomics does not have this limitation as the transcripts of all microorganisms are assessed using bulk RNA sequencing. To our knowledge, only two studies have used meta-transcriptomics to report on the presence of resistance genes that are functionally active under natural conditions in human and environmental samples [37, 38]. Birds foraging at the partially treated lagoons of a wastewater treatment plant (the last stage of the wastewater treatment process, after aerating and decanting has taken place) had a significantly higher diversity and abundance of antibiotic resistance genes, as well as a significantly higher number of antibiotic classes against which these genes confer resistance (Kruskal-Wallis p < 0.05, Fig. 2). 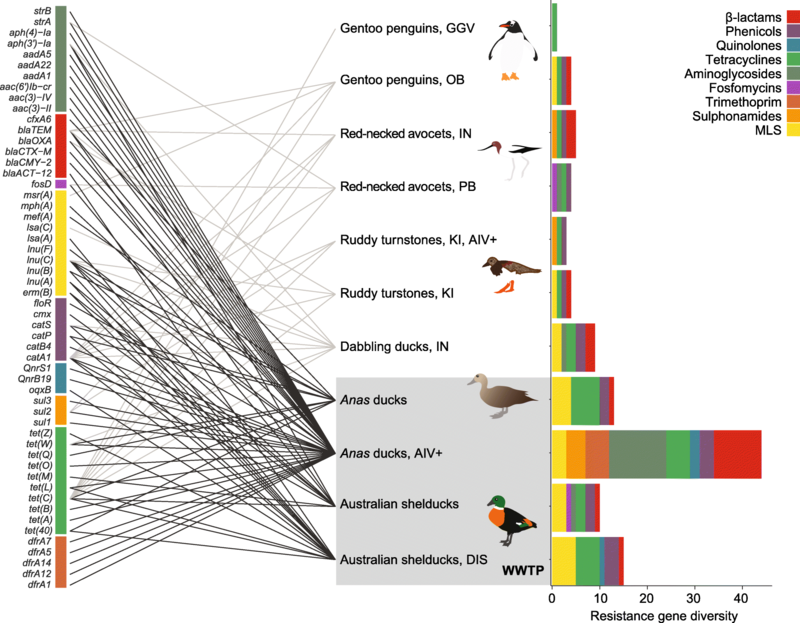 For simplicity, we refer to the resistance gene diversity, abundance (i.e., gene expression levels), and number of antibiotic classes to which these genes confer resistance as “resistance gene burden” or “resistance load.” Most notably, ducks (order Anseriformes) foraging at the WWTP harbored 86% of the resistance gene diversity observed, most of which occurred exclusively at the WWTP (Figs. 1 and 2, Additional file 1: Table S2). Pearson’s correlation, Spearman’s correlation, and nested linear regression models showed that the greater resistance gene burden in birds from the WWTP is not a sequencing depth artifact (Additional file 1: Table S3, Additional file 2: Supplementary Materials) [27, 39, 40, 41, 42, 43, 44, 45, 46, 47, 48, 49, 50, 51]. We have also observed that the abundance of resistance genes correlates with the number of mRNA reads attributed to the microbial community (i.e., after removing host reads), at least when using one of the correlation tests performed (Spearman’s correlation, p = 0.04, Additional file 2: Supplementary Methods) [27, 39, 40, 41, 42, 43, 44, 45, 46, 47, 48, 49, 50, 51]. This correlation suggests that it is possible that birds with a higher resistance gene burden also have a higher abundance of gut bacteria. The bird microbiome, and consequently its functional profile, can also be affected by avian pathogens . We sampled birds with avian influenza virus infection and Newcastle disease symptoms; potential associations between these infections and antibiotic resistance are discussed in the Additional file 2: Supplementary Results and Discussion [53, 54, 55, 56, 57]. Samples were collected as part of long-term avian influenza virus surveillance studies [86, 87, 88, 89, 90, 91]. Ethics approvals, bird capture methods, and sample handling are reported in the Additional file 2: Supplementary Materials. In short, cloacal swabs were collected using a sterile-tipped applicator. Additional oropharyngeal swabs were collected for ruddy turnstones in King Island and merged with their cloacal swabs. Samples were placed in viral transport media (VTM, Brain-heart infusion broth containing 2 × 106 U/L penicillin, 0.2 mg/ml streptomycin, 0.5 mg/ml gentamicin, 500 U/ml amphotericin B, Sigma), kept refrigerated (4–8 °C), and stored at − 80 °C within 8 to10 h of collection, with the exception of samples from turnstones, which were kept refrigerated for up to 7 days after collection before being stored at − 80 °C. VTM is a standard buffer used in avian influenza surveys and has the advantage of killing a portion of non-resistant bacterial strains. This step enriches meta-transcriptome libraries with antibiotic-resistant bacteria and, consequently, increases the sensitivity of the antibiotic resistance survey. Naturally, antibiotic treatment can induce the expression of antibiotic resistance, allowing their detection with meta-transcriptomics. Apart from the abovementioned exceptions with turnstones, all samples were processed in the same manner. The resistance gene burden of turnstones does not differ substantially from other non-WWTP samples (or other Charadriiformes libraries—e.g., Figure 1), and therefore there is no reason to believe that sample processing would impact the conclusions of this study.